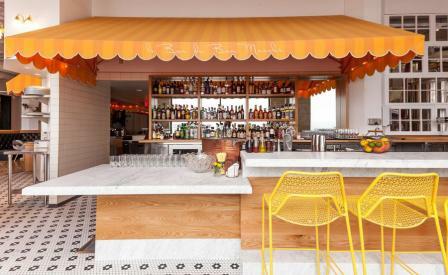 Among the eateries revitalising San Francisco’s once-gritty Mid-Market neighborhood into the city’s most buzzy food and drinks corridor is Bon Marché, a sunny Californian take on Le Marais. This 7500-square-foot space combines a café, a brewery, an oyster bar, a full-service restaurant, and even a flower shop that doubles as a stage for live jazz at night. Restaurateur Matt Semmelhack’s Deco-meets-the-Right-Bank design incorporates mosaic penny tiles, brass finishing, and leather banquets with floor-to-ceiling windows that erase the boundary between the interior and the city. Subtle changes in colours signal Bon Marché’s diverse spaces, connected by alleyway-like passages. In the open kitchen you may catch glimpses of Executive Chef Mark Liberman, whose previous collaboration with Semmelhack gave birth to the inventive and elegant restaurant AQ. He puts light Californian touches on hearty brasserie classics—think steak frites served with watercress, a leg of lamb with freshly plucked and grilled squash. And true to the original meaning of brasserie, Bon Marché has begun serving its own beer, brewed on-site. For those who are less inclined to ales and stouts, the bar programme includes cocktails inspired by vintage cinema, such as a concoction of Palo Cortado, coconut cordial, and Amargo bitters, dedicated to Luis Buñuel’s Belle du Jour.